Below is a video of the recent LMS walking pilgrimage to Walsingham. About 90 people took part in the 55 mile walk from Ely to Walsingham which took place over the August bank holiday weekend. The video was filmed and edited by Mike Lord. Besides the walkers, others joined the pilgrimage at Walsingham, including a group that travelled by coach from London. In fact, there were about 300 at the final Mass, and many of these walked the Holy Mile, some barefoot, to the ruins of the medieval abbey. Three priests accompanied the pilgrimage over the three days. These were Fr Bede Rowe, Fr John Cahill and Fr Michael Rowe (no relation) who had travelled from Australia. Also, there were several seminarians or young men who were about to be seminarians. One good thing about the Church of England is that they publish detailed statistics and financial statements. They have just published a report (they do this annually) on the expenditure incurred by bishops and archbishops. Including the two archbishops, there are 113 of these, made up of 44 diocesan and 69 suffragan bishops. All these figures are broken down for each of the 113 bishops. I suppose that compiling the report must have cost a fair bit. It does seem an incredible amount of money. If you're within reach of Darlington a week today, you may be interested in coming along. 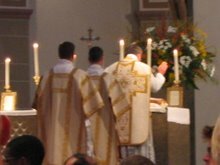 The Mass itself takes place at the end of a locally arranged training day for servers in the EF. The celebrant will be Fr. Michael Brown, a good priest known to many of us, who is also the Northern Chaplain of the LMS. The Rudgate Singers' involvement is in providing all the music for the Mass. Sung Mass for the feast of St. Wilfrid. Victoria Missa O Quam Gloriosum and motets Ecce Sacerdos Magnus and O Quam Gloriosum. The Benedictine Abbey of St Paul at Wisques, which is a few miles from Calais, has suffered from a lack of vocations in recent decades. It had got to the point where the few remaining monks were mostly over the age of 75, and saw little future for the abbey as an independent foundation. The prospect of the monastery closing down, and being converted for secular use seemed not far away. However, a much happier solution has been found. With the approval of the dwindling community, the Bishop of Arras, Bishop Jaeger, invited the monks of Fontgombault to take over the buildings, and send some of their monks to reinvigorate the monastery. This has now happened, and Wisques has become a daughter house of Fontgombault, reverting to the status it had when first formed. The abbey at Wisques will adopt the uses and customs of Fontgombault which is a fully traditional monastery. That means that all Masses and the Office will be in the ancient Benedictine form. Wisques is the fifth daughter house to be founded from Fontgombault. It follows Randol Abbey, Triors Abbey, Gausson Priory in France and Cleer Creek Abbey in the USA. There are also several other French monasteries use the traditional rites of the Latin Church, including, most notably, Le Barroux in the very south of France. 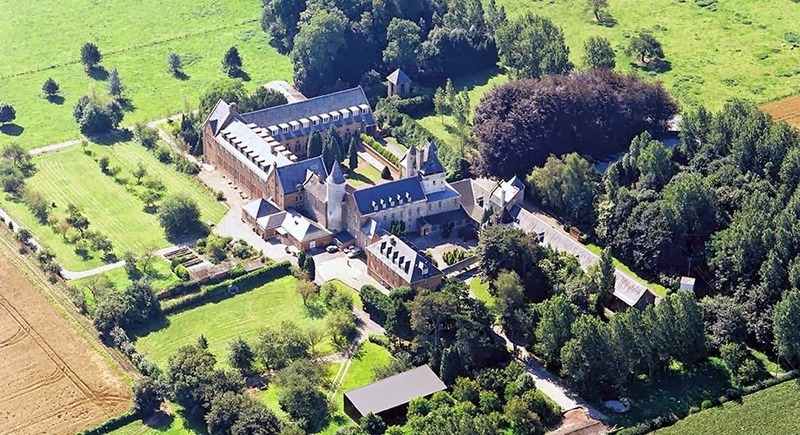 Here is an aerial view of the abbey at Wisques. There are now ten young men from England and Wales studying for the priesthood at the seminaries of the Priestly Fraternity of St Peter. Three are at Wigratzbad in Bavaria, and seven are at Denton in the USA. In addition, there are six priests, already ordained in the Fraternity, who hale from England and Wales. All bar one of these are currently working abroad. We must hope and pray that all of these seminarians follow their vocation through to ordination. If that is the case, by the year 2020, he Fraternity will have sixteen ordained priests originating from England and Wales. To be strictly accurate, one will have Polish nationality, although he found his vocation in England. At present, two priests of the Fraternity are serving the faithful in England and Wales. One is a Frenchman, Fr de Malleray, and he is assisted by Fr Goddard. These are both based at Reading in Berkshire, and serve missions in the Portsmouth and Northampton Dioceses. Another priest of the Fraternity, Fr Emmerson, who is a citizen of the USA, is working in Scotland. So it could be said in respect of the Fraternity, that England and Wales is a net exporter of priests. Five of our home produced priests are working overseas, whereas only one from abroad is working here. As further priests are ordained, it is likely that the balance will be tipped even further in the direction of export. There are, of course, many reasons for this. No religious order can set up their stall in a particular place without the permission of the local ordinary. In practice, this generally means an invitation from the bishop of the diocese. 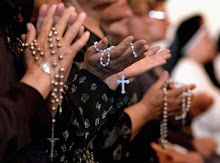 In England and Wales, no bishop has yet invited a traditional order to take over a parish. The presence of the FSSP in Reading and Chesham Bois has only chaplaincy status at present. However, this is not the case in some other countries. In the last twelve months, the Fraternity have been given the care of five parishes. One is in Holland, three are in the United States and one is in Australia. The FSSP already had parishes in Rome, Zurich and Nigeria, as well as several in the USA. It is to be hoped that, before long, an English bishop will invite the FSSP to take charge of a parish. One of the major cities would be a natural location, with London being the most obvious place. That would be a way of redressing the outflow of priests from this country.